The Filter Bubble book is about personal information gathered online and the invisible filtering algorithms that make use of that information. Facebook uses filters, Google uses filters, advertisers use filters. Who knows who will use and/or take advantage of such filtering systems in the future, Pariser wonders. I first a read a book on this topic sometime ago (maybe two or three years ago?). The book I read was Republic.Com by Cass Sunstein and I felt smugly pleased with myself when Sunstein's book was hailed and referenced multiple times throughout this book. 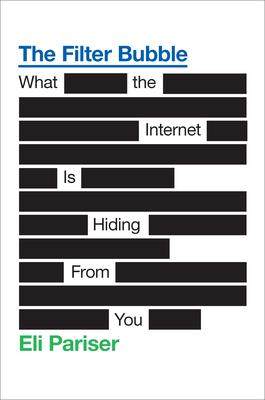 Sunstein's book (I would probably recommended his 2007 book, Republic 2.0 if I had read it...) was one of the first books to discuss the personalize and filtering that was beginning to take place online. Where the internet was once thought to be a marvellous tool that would break down all barriers between people, Sunstein realized that people were using the internet to put up barriers in the name of personalization. Sunstein's book focused heavily on what this would mean for democracy and was a very interesting read. Pariser's book served as, for me, a refresher of sorts. He didn't say anything new or revolutionary, but reading this book forced me to think about the topic (net filtration). As I posted on my Tumblr after watching Pariser's TED talk leading up to the release of this book, I like to think this is the sort of thing I am aware of. It's important to think about who is controlling what you see, and why, and how. It's good to listen to opposing viewpoints in order to further the growth of your opinion, for example. While I have difficulty believing the hypothesis that filtering will reach unreasonable extremes and rise to dictator-like control levels (I suppose anything is possible but I have trouble with theories that resemble science fiction), I agree that it couldn't hurt for Google and other major corporations to make their filtering algorithms public. Sure, they help me find information I'm looking for quicker (I think...) but I want to be able to see what they're keeping from me. That's my two cents on this topic...if you use the Internet at all (which you do, can't deny it now!) then I suggest you read this book for a decent introduction or, better yet, check out Sunstein's writing on the topic. It's an important subject that will become increasingly important with the blossoming international popularity of the web. Algorithms feeding algorithms...if Google thinks you like one thing, it'll show you more of that one thing, which means you'll click on more of that one thing, and Google will think you like it more...you get the idea.